Owned by PVH Corp, from this season, Tommy Hilfiger will become the Official Apparel Partner of the Mercedes team, building on the sport sponsorship heritage that Tommy Hilfiger has embraced since first founding his brand, and underscoring his vision to continuously elevate and expand the brand in key markets to the next generation of Tommy Hilfiger consumers. 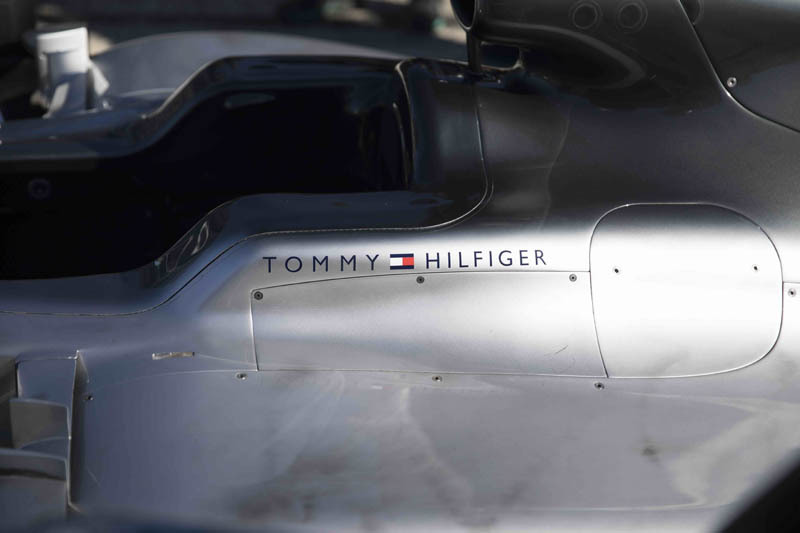 The new partnership, which effectively replaces that with Hugo Boss which has quit F1 for Formula E, will see Tommy Hilfiger providing Mercedes' race and travel wear, as well as factory, office and hospitality clothing. The distinctive Tommy Hilfiger logo will debut on the Mercedes W09 at the team's launch event at Silverstone later this month, as well as featuring on garage and trackside assets. "We are delighted to welcome Tommy Hilfiger to Mercedes-AMG Petronas Motorsport and back to the world of Formula One," said Toto Wolff. "It is always exciting to embark on a new partnership, particularly when it touches such a key area of our team's image; I am positive that it will energise our brand and bring a new spin to how we are perceived from this season. We are excited to see how Tommy Hilfiger will dress the team this season and to showcase their exciting plans to the fans of Formula One." The Tommy Hilfiger brand heritage is closely linked to working with sports icons and pop culture. Tommy Hilfiger's history with Formula One began through team sponsorship in 1991 and continued throughout the decade. "From the first time I attended a Formula One race, I was completely fascinated by the world of motorsports," said Tommy Hilfiger. "To be re-entering this arena with World Champions Mercedes-AMG Petronas Motorsport and their number one team is an incredible way to fuse fashion and Formula One. I recognise the passion, spirit and drive that the entire Mercedes-AMG Petronas Motorsport team shows at every race, and these shared qualities are why I'm excited to partner with them for the upcoming seasons." The Spring 2018 Tommy Hilfiger campaign celebrates the fusion of fashion and Formula One, with Tommy Hilfiger and Mercedes-AMG Petronas Motorsport sharing a pioneering spirit and drive to succeed. "The exciting partnership with Mercedes-AMG Petronas Motorsport is a celebration of our shared commitment to keep technology and innovation at the core of our business," said Daniel Grieder, CEO Tommy Hilfiger Global and PVH Europe. "We take pride in partnering with organisations that are the best in their industries and share our passion to attract and retain the best-in-class teams. We are excited to leverage the incredible reach that Formula One has worldwide as we continue to build on our brand's global recognition and bring Tommy Hilfiger to new audiences." BP Castrol extends Renault sponsorship deal by "at least five years"
"After seeing this news, I went to check McLaren’s partners page and apparently Michael Kors is not a partner anymore! Strange seeing that they just signed with them in 2016." "The Ferrari branded Tommy Hilfiger stuff goes for all the money, so it may be a worth while investment to buy a few Merecedes-AMG jackets to store for the future."